Admittedly, buying gifts for a tea snob can be very hard. Beyond figuring out what they like to drink, there is all the equipment, which they may already own. So we like to turn to the experts at giving tea gifts, the Chinese, to find the right tea with the right meaning for our favorite tea snobs. Below are the 3 popular gifts for tea lovers in China and the stories behind why they are so popular. Ti Kuan Yin – This beautiful oolong named after the Iron Goddess of Mercy is prized for its beautiful flavor and story about its creation. 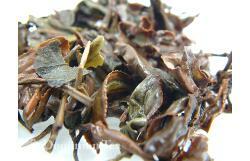 It is also one of the oldest oolongs produced in China, having been created sometime during the 18th century. 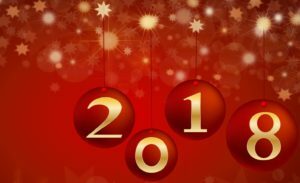 Giving the gift that came from the Iron Goddess of Mercy shows the gift receiver that you wish them health and prosperity well into their future. Puerh from Yunnan Provence – Given for its health benefits, Puerh tea is thought of as the fine wine of tea. It only gets better with age. This fermented tea is over 2,000 years old and can be made with a black, green or white tea base. The bacteria that is added to allow for the fermentation creates a naturally sweet and smooth tea with lots of complex flavors. This tea is usually purchased in cakes or bricks and is broken apart to make a cup of tea. 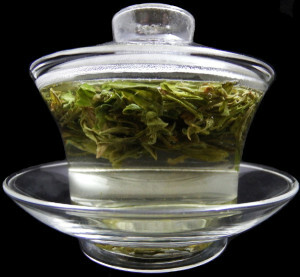 Bai Hao Silver Needle – Exquisite first pluck of the newest growth of the tea plant. 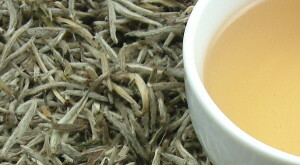 Bai Hao Silver Needle – This prized white tea has been under production during the Song Dynasty (969-1269 C.E.) but did not enter the European literature until the 1800’s. Its soft and floral flavor as well as the silver hairs on the tea leaves are distinctive characteristics that cannot be found in other teas. This is a more expensive tea as it can really only be plucked during the first harvest of the season. This tea was often given as a gift to the reigning Emperor as it was the first tea of the season. There are a few characteristics these teas share, each one has been manufactured for centuries, given as gifts to Chinese Emperors to bring them good health and luck, and have exquisite and complex flavors. We’ve looked at puerh twice now and the last time we spoke of the difference between raw and cooked pu’erh. In the spirit of ‘there no such thing as too much of a good thing’ this time we want to spend a bit more time on the manufacturing of raw ‘Sheng Cha’ puerh. While many Chinese teas are produced from a variety of c. sinensis var sinensis, the most desired puerh teas are typically from c. sinensis var assamica (see Camellia Sinensis). This is a much larger leaf version of the tea plant than var sinensis. Even more desired are the spring picked leaves of old growth wild tea trees rather than younger wild trees or cultivated tea bushes. After picking the leaves undergo a process of heating to quickly ‘kill the green’. This process of heating the leaves effectively stops most oxidation, makes the leaves more flexible and pliable, and leads to the next step of rolling. Rolling, in turn step serves to break down the cellular structure inside the leaves allowing the juices inside the leaves to move about more freely and creates small tears in the leaf structure. This critical step enables extraction of flavor when the tea is infused in water many years in the future. Once the leaves have been rolled they are left in the sun to dry out. The amount of time, like other steps in this process vary from factory to factory but can be up to a couple days. It’s at this point that we have ‘Mao Cha’ and the process diverges for raw ‘Sheng’ puerh vs cooked ‘Shu’ puerh. The real magic happens with Sheng Cha after the initial steps leading to Mao Cha. At this point the normal process is to process the Mao Cha into finished pressed tea cakes. The rough product is often stored for some amount of time before its ready to be pressed. When the manufacturer determines it is time the rough Mao Cha is sorted into grades and steamed to prepare it for pressing. This steaming ensures the leaves are pliable again and slightly sticky so the resulting form holds together. Steamed and ready to go the tea is pressed into a desired shape. This is often a large round disc or cake but can take many other forms like bricks, coins, balls, or even a sort of mushroom shape. Traditionally this would be pressed into the shape by a heavy stone placed over the form though mechanical presses often do this in many factories. Pressed tea is much more dense and easier to handle. During the time of the tea-horse road this was essential to facilitate trade and today it still makes the tea much easier to handle and transport. Pressed into the desired shape, Raw ‘Sheng’ Puerh is now stored for long term ripening, or fermentation. Unlike other forms of tea which are best used within about a year, raw puerh is best when aged. It mellows over years of aging and becomes more sought after the older it gets. If you haven’t tried puerh its best to take some time and learn about it. Sheng and Shu puerh both provide very unique experiences. However, to fully enjoy them its best to also get a Yixing tea pot and learn how to quickly infuse this tea many times, exploring how the taste changes between infusions. We’ve written before about puerh and dark teas. This style of teas are the only ones which are truly fermented instead of being oxidized like all others. In our earlier post however we just barely scratched the surface so in this post we revisit the topic in a bit more depth. Puerh emerged via a happy accident from the transport of tea along the tea horse road from Yunnan Province to Mongolia where it fermented along the journey and was traded for war horses. Over time demand overwhelmed supply and a method of speeding along production was needed. Thus production shifted to one of two methods; raw or cooked. Both provide a distinct, mellow and earthy taste though they are certainly not the same in taste or cost. Raw puerh is also referred to as sheng or green is produced naturally, allowing the tea to ferment as it ages over many years. Some of the best raw puerh is actually decades old, like a fine wine, getting better with age. 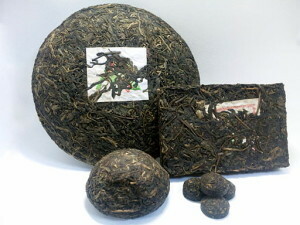 Good quality raw puerh, stored well, will steadily increase in value with some fetching tens of thousands of dollars. For some, though very risky, it’s even seen as an investment. It is produced in slightly different ways depending on the factory producing it and their own closely guarded method. However, the general process is to air dry fresh leaves, process and knead the leaves and sun dry the leaves. Finally, the loose puerh leaf is steamed and placed in a mold for final shaping before going into storage, ideally for 15 to 20 years of aging and fermentation. Raw puerh cakes generally look a bit more green and the liquor color tends to be quite a bit lighter than that of cooked puerh. As it ages the flavor will develop and mellow. The far more modern development is cooked puerh. 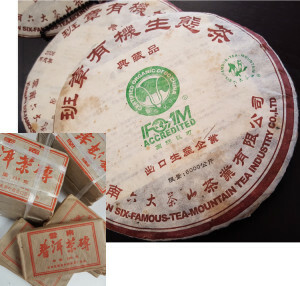 Also called shu or ripe, this version is artificially aged in order to produce products in a short period of time and satisfy some of the demand for puerh. Like its raw cousin the factories which produce it each have their own variations, though the process originated in 1973 at Kunming Tea Factory. Production of cooked puerh is substantially different than for raw. In this case leaves are piled on the factory floor and watered down in a process akin to composting. The specific steps here vary as does the length of time depending on the desired speed of this artificial aging. As a last step, like raw puerh, it is finally steamed and compressed. Cooked puerh cakes are much darker, with leaf tips having darkened considerably to a golden or brown color. 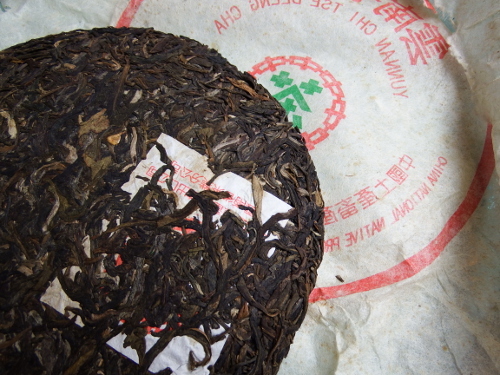 Similarly, the liquor of cooked puerh is a deep red or brown color. 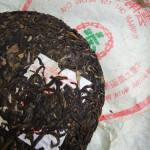 Puerh is available in loose leaf form, though more often it is found compressed into various forms. 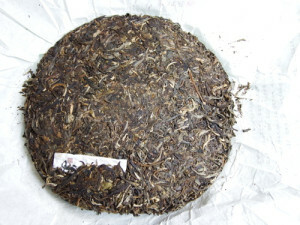 Puerh cakes can be quite large, almost the size of a dinner plate or even a discus. While this is a very typical form, it can be compressed into any number of shapes and sizes. 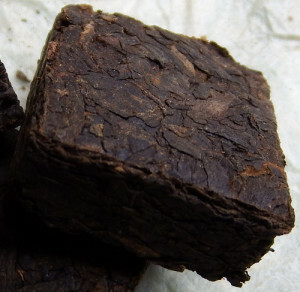 For example some puerh is compressed into small squares, enough for one serving and sold in boxes of many squares. Other options include rectangles similar in size to a large candy bar, balls, small birds nest shapes, large balls, coins, and more. A great place to start is with a small package of cooked puerh. This allows you to dip a toe in the water without waiting years to enjoy your tea and experimenting at a reasonable starting price.